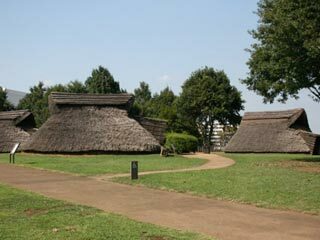 Otsuka Saikachi Relics Park(大塚・歳勝土跡公園, otsukasaikachidosekikoen) is the ruin of Japanese village of Yayoi period, approximately 2000 years ago. There ruins of houses, tombs and barricade which you can see how the village was composed. One hundred people were considered to live there those days. There are seven pit dwellings a high-floor storehouse, molded remains and a wooden bridge in the relic. Also, bamboo forest, and classic houses are displayed in this park. Saikachi Relics is the cemetery of the villagers of Otsuka Relics. There are many squired tombs and wooden coffins which rebuilt after the excavation. There is a classic house in the middle of the Tokugawa Period. The house of Nagawasa Family, who used to be the head of the former Ushikubo Village near the Relics park was moved here. There are also many facilities for kid's play, and workshop house.